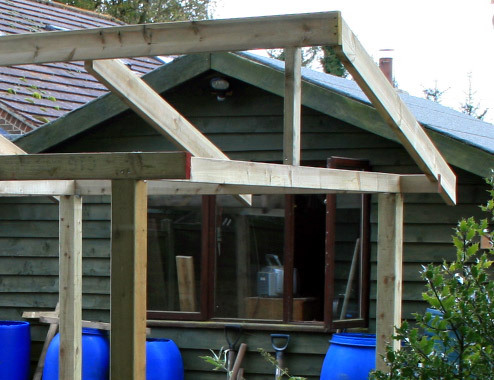 Pleased to say the weather held off most of the weekend which meant we could carry on with building the new wood store. Basically we don’t have enough space to store any wood and wood figures quite a lot in our lives as we use it as our main source of heat so it made sense to build a wood store. John took a days holiday on Friday which I thought with the weekend would give us plenty of time to finish the project, but as with all my projects they just take twice as long as I thought! As the building is going to have to cope with the worst of the winter weather I’m using pressure treated timber for the main structure. I used 6 x 4 (inch) for the roof joists and 4 x 2 (inch) for the wall plates. I decided to sit the wall plates on edge for strength and used a combination of galvanised metal plates and 3″ all weather screws as fixings. As the roof is going to be covered in a decent grade of roofing felt I’m using 2400mm x 1220mm OSB board, as a cheaper alternative to regular plywood. 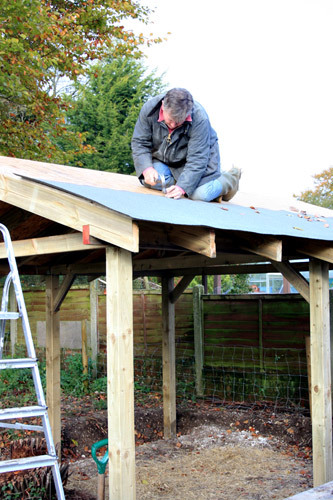 I should start by saying I am definitely no expert when it comes to building a pitch roof but I’ve done it once before and although it’s not a simple job, by following a few basic principles, i.e. measure twice cut once and check everything is lined up before fixing anything, it’s possible to make a half decent job. To begin with I prepared a couple of supports for each cross rail exactly half way to support the ridge beam while the roofing joists were being cut to size. Next I cut the ridge beam to the full length of the building (3.5m) including an extra 200m overhang for each end and fixed the beam temporarily using the two supports. 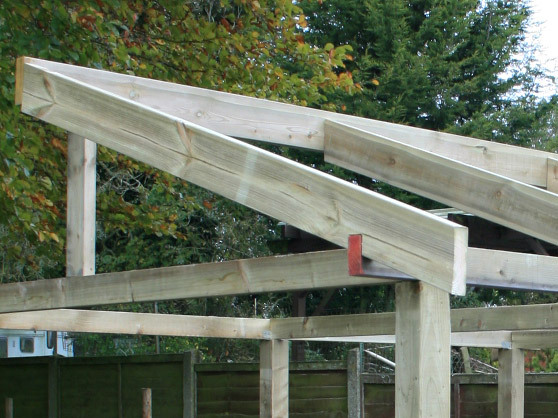 It’s really important the ridge beam is level or the joists just won’t sit right. When it came to the joists I took a measurement from the top of the ridge beam to the top of the wall plate and then add a 250mm overhang. 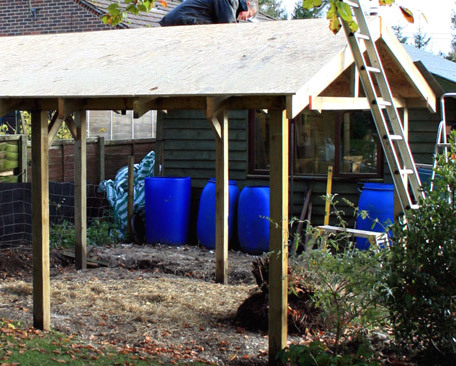 I recommend marking up the opposite side of the roof separately as I find the measurements are never quite the same, despite spending ages making sure the structure is symmetrical. Tip: I also leave an extra couple of inches on the length to eliminate the possibility of cutting it too short and gradually trim it back to fit. This way it’s never too short. Having cut the first joist to length I offered it up to the end of the ridge beam and rested the other end on the top of the wall plate while I marked the angle at the ridge beam. It would have been easier to simply nail the joist to the wall plate, but I wanted to cut a step into the roof joist so it would sit better on the plate and provide more surface for fixing. You can see in the picture below I’ve already removed the step and cut the joist to fit the ridge beam. As with the ridge beam I offered the joist up to the end of the wall plate and marked out a step. With the step removed and fitting snug on the wall plate I now had a template for the the rest of the joists. Having cut all the beams to size they were ready for fixing, but before then I had to work out the correct spacing between each of the joists. The general rule of thumb with joists is to fix every 610 mm or just over 2 feet, and as my OSB sheets are 2400 mm x 1220 mm (8 x 4 in old money) I could go ahead and mark a pencil line on the ridge beam at 610 mm intervals knowing the boards would line up exactly with the pencil line. I also marked the ridge beam with a pencil line 20 mm from the top edge so when the roof boards are laid they sit flush with the top of the ridge beam, leaving a neat finish. Next I fixed the first joist flush with the end of the ridge beam (front face) using 3″ all weather screws driven in from the opposite side of the beam, and then added the second joist taking care to line up the centre of the joist with my 1220 pencil mark. Then I added a third joist exactly half way between the first and second. Another useful tip I picked up along the way is leave fixing the joists to the wall plate until you’ve laid the plywood boards on the roof. This means you can position each beam exactly with the edge of the roof boards before fixing permanently to the wall plate. With all the joists in place and fixed nice and firm the OSB boards went on using 40 mm galvanised nails. There was about a 12 inch overhang which I cut back flush with the end of the joists. Starting to look like the real thing! When I buy roofing felt I tend to go for the thicker grade as you really do get what you pay for when it comes to roofing felt. I’ve used the standard grade before but it soon ripped off by the wind. Then laid it at the bottom of the roof line nearest the wall plate using the ridge beam as a guide to keep it parallel. The next length was tacked 4″ over the top of the first so any rainwater simply run over the top of the join and down the roof into the gutter. Final job was to fix it down the felt with 3/4″ clout nails and the job was done! Unfortunately we ran out of felt by the time we got to the ridge line, so will need get buy more during the week. Should be able to finish off the felting and complete the sides and finishing touches next weekend if the weather holds, so will post the final installment next week. Feel free to leave a comment if you have any questions about our Wood Store project .